The Temple of Hephaestus, formerly known as that of Thesseus. ​​​Thesseion (also Thiseio, Thisio or Thissio) is the name of a historic neighborhood in the heart of Athens, NW of the Acropolis, 1.5 km SW of downtown, and 1 km SW of the Athens City Hall. Its name derives from the Temple of Hephaestus, formerly known as Thesseion, as it was, in earlier times, considered to be a temple of the hero Thesseus. At the intersection of Apostolou Pavlou and Adrianou Streets, a vandalized statue of Thesseus by sculptor Georgios Vitalis (1838-1901), is positioned so that the hero may view the historic Athenian neighborhood that bears his name, honoring him for his brave expedition to Crete that resulted in killing the mythical Minotaur and releasing the Athenians from the unbearable taxation that the Minoans had imposed upon them. ​Thesseion takes in the ancient Agora, the neighborhood of Petralona, and Kerameikos, which includes the Assomaton Square. The area has numerous cafes and meeting points, which are most crowded during summer, but not only, and is served by the nearby overground train station of the same name. Apostolou Pavlou pedestrian street connects Thesseion Train Station to the entrance of the Acropolis and is a pleasant pedestrian walkway lined with coffee-shops and eateries. 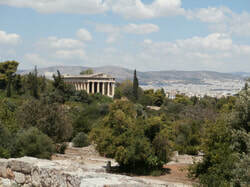 Both the Acropolis and the Agora archaeological site are clearly visible from Apostolou Pavlou street. Herakleidon street, running from Apostolou Pavlou toward the west leads to the Gazi area. Again Herakleidon is full of cafeterias and mezedopoleia (eateries offering drinks and some snack food to go with). Melina Merkouri Cultural Center is at the west end of the same street. The main square of the neighborhood of Thesseion, known up until recently as Thesseion Square, was officially renamed in honor of the French Franco-Greek philologist, classical scholar, fiction writer and world-renowned Grecophile, Jacqueline Worms de Romilly (1913 – 2010) primarily known for her work on the culture and language of ancient Greece, and in particular on Thucydides.​ A professor at the Sorbonne, she was promoted to the chair of Greek and the development of moral and political thought at the Collège de France — the first woman nominated to this prestigious institution. In 1988, she was the second woman ever to enter the Académie française. She obtained Greek nationality and later was named as an Ambassador of Hellenism by the Greek government. We recommend Herodion, a fabulous hotel, according to hundreds of Booking reviewers. It is a medium-size hotel, a few hundred yards from the Acropolis and Herodeon or the New Acropolis Museum, offering modern, elegantly decorated air-conditioned rooms, fitted with a satellite TV, safe and soundproof windows. Most of the rooms have private balconies and some have a view of the Acropolis. It has a roof garden with lounge chairs and 2 hot bathtubs with views of Athens. The rooftop restaurant serves Mediterranean cuisine with Greek influences, and a variety of cocktails. In between, guests can enjoy snacks and homemade desserts in the semi-outdoor area in the hotel's back garden. An indoor restaurant is also included, where breakfast is served. 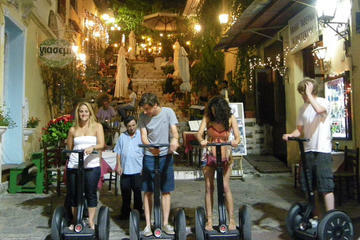 See the highlights of Athens by night on this evening Segway tour, led by an expert local guide! On your self-balancing electric Segway, explore buzzing neighborhoods like Plaka and Thesseion, and then head up the brightly lit Acropolis of Athens for panoramic nighttime views of the city. See classical ruins like the Ancient Agora of Athens and then head back into the city center to see more illuminated attractions such as the iconic Temple of Zeus. This small-group evening Segway tour is limited to 12 people, ensuring you’ll receive special attention from your guide.